Yesterday my esteemed colleague Carlos Kiyan gave the presentation on our mobile project in Lima, Peru. As he is a very vivid speaker, it was fun to hear him present. He gave a holistic view of everything that comes into the equation if you want to start up a mobile learning project in an area that is not used to it. View more OpenOffice presentations from ignatia. 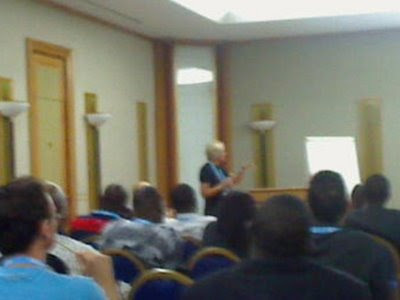 One of the workshops in eLearning Africa 2009 was lead by George Siemens, a Canadian from the Manitoba University who was one of the organisers of the CKK08 massive course in 2008 in which I participated my two cents. He is always a source of innovative ideas. It comprises a lot of names from the educational realm, so if you are interested in pedagogy, you want to look for new (or I like to see them as the historically old) ways of learning, just look up a couple of these persons and dive in. A name I had to google was Seymour Papert, and it showed me again that learning is based on sharing knowledge through networks. I know I will never know all I am interested in, but I love exploring new information. View more OpenOffice presentations from gsiemens. (John is a man in white, with glasses, holistic in speech and thinking). He looks at projects that have been at what has been tried and tested all across the world. technology to reach people and to transform them into a different technological world. Mobile learning fills the gap that 'normal' learning cannot reach. We managed to extend the perception of what people mean with learning. We can transform, enrich and extend the ideas of learning itself. Taking learning out of the classroom. John mentions that the classroom is the last resort for learning. localised learning, location awareness becomes more wide spread. Scale and sustainability: small pilot, big pilot, evaluation, implement ... but up until now there is no combined research for these kinds of projects. Cost-benefit is key to take sustainability into account. Meraka: audio wiki project. It exploits the devices students already own. this is the way to go, because it is obvious that everyone choses their phones, so building on personal individuality is key for sustainability and respect for the material. mLearning is used to produce content, that is one step further. The people holding the phones start to learn based on their context, on their priorities. it also gives people the chance to discuss what they learn with their peers. so problem on how to turn young people into critical, literate global citizens that hold their own learning. Mobile learning is based around autonomy, so we do no longer build conformist students, with a colonist amount of information (my remark: hallellujah for that, diversit rules!). Big desire to show how mobile phones can be used sustainably in developing countries. The mobile penetration in South Africa is very high. Compare current technology uptake and access in South Africa. the school children were the audience, so they were taken in as participative audience that were incorporated from the beginning while the project was taking shape. The students were already using mixt, so this mixt was linked to mathematics. Focus on mathematics grade 10 learners and grade 9 all exercises based (an sms solution). The content was completely matching the curriculum. The Nokia people were not researchers, but based there project on common sense and with added remarks from researchers from South-Africa, like the people from the Meraka Institute. So it was very user centered. Extra: the competencies of all the students could more easily be monitored. So the exercises were added to a database for teachers to monitor. 260 students access it 14000 quizes done, 50000 accesses... so from the log files Nokia could see the students accessed the quizes 24 hours, all day/night long, so much more than only classroom. The ethical risks with mixt: students can use mixt, but it is not always clear who they are chatting with, but the government of SA is investigating mixt in an educational environment. Will pick up on the MXit later. They do early feasibility tests and look locally for technical solutions, which I like enormously. Yesterday I had the pleasure of collaborating with John Traxler and David Hollow during a workshop on Effective Evaluation. 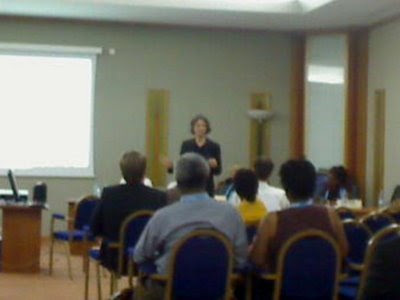 The workshop was part of the pre-conference workshops organized in eLearning Africa. We had ten participants, but they were a very inspiring bunch. For those with limited time, just go to the last ‘ethics and quality’ part of the post. For this workshop John suggested that we use the Delphi technique to get the most out of both the participants and all the available knowledge in the room. The technique demands a lot of dynamic (re)thinking within the groups. Each person reads out and explains their five items. Facilitator merges list from everyone's items. Stop after the planned three topic rounds (principle and priorities, models and tools, ethics and quality, in this case). Normally the Delphi technique uses iterations until a consensus is reached, but due to time constraints only a couple of iterations could be made to rethink the groups thoughts on each topic. But still the strenghts came out. During each round the three of us (John, David and I) would listen to what happens and add some points when relevant, but keeping the groups working with their own ideas. Each group started from an example scenario of an eLearning project and the groups were asked to start thinking about how they would evaluate the particular projects. To enable step-by-step growth into evaluation, the above three parts were drawn up to give the process some feasible steps to work on. As the discussions went on, you could see the group synergizing. All the individuals were motivating and inspiring each other throughout the process. Again it was easy to see that the group surpluses the individual. What was so nice to see was that the philosophy of the evaluation was already mentioned the first parts of the evaluation process, leading up to the third part of the workshop, namely the ethics and quality part. This was to my opinion the most inspiring part of the workshop, as personal opinions, philosophies and ethics come forward to give direction to the overall evaluation process. Although ethics and quality do define how we live our lives and the choices we make, it is not always consciously considered from the start of an evaluation. But the impact it has is enormous. What was mentioned? Consent of the participants, guilty knowledge (= knowledge you as an evaluator sometimes can acquire from the audience, but that you wished you had not known), transparency of the process. Go for confidentiality not anonymity, because the in this digital age anonymity can seldom be assured. Do an audience or member feedback check (part of transparency): if you do extract data from specific audience members cross check if they agree with what you have drawn up. The design of the tool/evaluation should consider the (sub)cultural parts of the groups (all groups have their set of rules of what is acceptable/ethically appropriate or not in terms of behavior etcetera). User centered evaluations can decrease the power diversity between the evaluator and the evaluee. There is an evaluation workshop coming up in Uppsala, Sweden in September 2009, focusing on ICT4D evaluation, but aiming at PhD students. In general it was agreed upon that an understandable and clear code of ethics should always be drawn up before starting an evaluation. The eLearning Guild has launched its recent call for presenters. And if you still have some time in the fall, or you want to show off your latest eLearning accomplishment, this might just be for you. I have put two proposals in, one on mobile learning with added social media (for the online fora) and one on the challenges of eLearning with a focus on cultural diversity (for the DevLearn conference). Hoping they will get through the selection process. So digg in and get your proposals to the eLearning Guild as well. Oct 1–2 | Globalization, Localization, Translation, Oh MY! Proposals are now being accepted. You don’t need experience presenting online (we have coaches who will help you). Not only do others benefit from hearing your story, but you gain professional experience and receive a free registration to the event! Submit Your Proposal Today!" as mentioned in the eLearning Guild's newsletter. The DevLearn conference is a great conference to meet with fellow eLearning professionals from across the globe. It will be organized in San José, California, USA this year from 10 - 13 November 2009. Just take a look at the aim of the conference and if you feel like it, put in a proposal but watch out for the deadline: 22 May 2009. Clearly it was a proposal writing day today. It is Friday, my head is already moving into weekend-drive and so I was looking for something small and nice to share. Twitter is used by a lot of people at this point. Some of its use is focusing on real-time feedback from participants, learners, students... So I bundled a few of the nice twitter applications that let you stay on top of everything that is happening in and during your event (when hastagged). If you are emerged in Twitter, you will have been using all of these and more, but otherwise, these apps can bring an 'aaaaahhhaaaa'-feeling to any event you are hosting or participating in. First of all, no matter what type of course, event... you are moderating or presenting Twitter can add to your overall communication. But as such all of the students, participants and stakeholders need to be in synch with the event. So you need to set up a hashtag that people can use in order for other twitters to find relevant information that is posted for the event. If you want to get a feel of what is going on, put in a hashtag at this #hashtags search site to see what comes up (e.g. #eLearning or let's say you are presenting at Brussels Internet Convention in 2070; then a possible hashtag would be: #BIC2070 or #BIC70) and who is using those hashtags. Some of these applications to ask your twitter account, so if you did not set it up yet, you might want to. If you want to stay on top and interact with the people that send you comments through hashtags, you might want to use tweetchat as it enables you to interact just like twitter (comments, favorite). 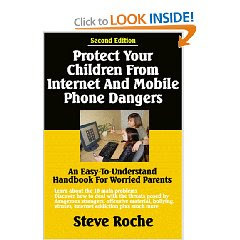 I like this one for if I have more time to interact behind the computer or mobile. All you need to do is open tweetchat and put in the hashtag and off you go. Another option is Twitterfountain (Dutch based): this is a nice app if you want to add a widget to a central page and still be able to stay in touch with the relevant hashtagged remarks that are published. You just adjust the widget to what you want to see, copy it and paste it into any page or area you want. It can also add Flickr photos, so if you are having a multimedia presentation, you can ask people to send their pictures immediately to a dedicated flickr-account and .... those pictures will show as the background of the tweets (a bit busy though). Another nice application you can use for this purpose and which is less stressful for the eyes (in case you have a lively presentation) is twitterwall, it is easy and straight forward: you just go to twitterwall, put in your tag, if prefered you add a URL that will be shown as a background and ... you get the latest tweets on the topic. For example this link based on the 'eLearning africa' tag. This year's eLearning Africa Conference will be held in Dakar, Senegal. It promises to be a great event with a lot of creative, empowering demonstrations and presentations. During the conference I will try to live blog (some live blogging tips from others)/tweet as I am watching the different presentations, keynotes and workshops. 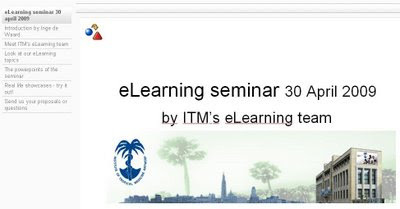 I will attend mostly mLearning topics. A pre-conference workshop on effective evaluation (workshop A1) organized by John Traxler and David Hollow (great and very knowledgeable people) who asked me to join them as a third expert (for which I am very grateful). The workshop will give the participants a (we hope) fun-filled and in-depth look at effective evaluation of TELearning materials and projects. A small excerpt describing this workshop: "There is a small but growing literature of evaluation of eLearning within development contexts. However, there remains a lack of a fully coherent and theorised framework for evaluation, especially when emergent or mobile technologies are being deployed. This workshop will contribute to a more systematic understanding of evaluation and impact-assessment within the field. Each theme will be preceded by a brief talk that will define the scope of the theme and provide examples in order to create a shared understanding and to catalyse discussion. Each theme will then be explored by small groups, with each working on different evaluation scenarios and devising or deciding issues, concerns and appropriate interventions." Then on Thursday I will join my wonderful colleague Carlos Kiyan when he will present the Institute of Tropical Medicine's mobile project funded by Tibotec and build in collaboration with the Tropical Institute Alexander von Humboldt in Peru. All of us have worked hard on this project, so we are looking forward to presenting it during the eLearning Africa conference. Below you can find our (still a bit draft) version of the presentation we will deliver. The project uses mobile devices (N95 and iPhone) to send mobile courses to medical workers in the field (in and around Lima). We use wifi, photosharing, skype, iclone ... just look at the options we choose. I did write a blogpost about the first endeavours for this Tibotec project here. View more presentations from ignatia. Not sure which hashtag to use for eLearning Africa, so I will use ela2009 and ela09... what do you think. Yesterday I had the opportunity to give an introduction on new learning techniques that can be used in secondary schools (at the Pleinschool in Kortrijk). This was a great opportunity to see how far I could go with teachers that were not accustomed to using TELearning in their projects or classrooms. Although some of them did use new media (soundwalks, theater video) most of them had no prior experience using new technologies. The presentation gave an overview and focused on user friendly tools (exelearning, articulate set ...), but also gave possibilities linked to social media. After an intense presentation, the teachers were inspired to dive into some of the shown techniques and they were enthusiastic (which definitely made my day). Along the presentation we uploaded life to flickr, youtube and ustream allowing the teachers to see the full potential and impact of some of these tools. The great thing about this particular school (Pleinschool in Kortrijk) is that it has a great variety of students and is located across three campuses. This makes it all the more essential to develop tools that attract different learning skills and that are pleasing to a variety of students. For those interested, you can take a look at the PowerPoint, but it is in Dutch. The examples might be interesting (example in Dutch = "voorbeeld" or abbreviated "vb". What if a virtual classroom is not accessible and you are left to your own devices to record a session? So yes, there are different virtual classrooms (dimdim, eluminate, wiziq...) and they have advantages (they save editing time, allow people to join synchronously and add questions), but there are days you simply have to take initiative and come up with workable solutions yourself if the connections fail you. To be honest, those are the type of challenges I like above all. So after two days of intense cutting and pasting, I did realize the time consuming part of it again. But on the other side, cutting and pasting does have an advantage, you can just add anything you like. In this small - how should I call it? - let's say: asynchronous-presentation-non-socialmedia-mash-up I have pasted real life movies into the powerpoint's that were shown, edited video and audio, got some extra's in (links to some showcases). So overall, I can integrate whatever in my own asynchronous virtual classroom, because I can mash-up anything I like. That is something pleasing. So for those interested, I linked life recordings, with mp3, with additional movies (original formats ranging from wmv, avi, flv to quicktime) and put it all in a website to give a structured and browsable overview. (I do apologize for the quality of the movies, I did not focus on the speakers with my camera settings... but next time I will be ready!). Hardware used: logitech pro 9000 HD webcam, portégé Toshiba R600. Software used: camtasia 6, eXelearning 1.4, AVS converter, FLV player. Our eLearning team only had 45 minutes to show a small selection of our latest developments to a general audience. So do not expect a lot of technical specifics, but the eSCART and mobile part might be of interest to you. The eSCART features some different solutions we have used in a fully online course and the mobile part focuses on mobile data research software. If you know a virtual classroom that enables you to upload movies and integrated social media of choice, let me know, I would love to check it out. 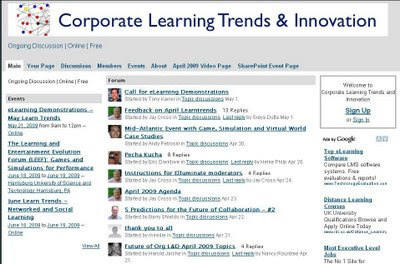 A couple of eLearning guru's have started the CLTI community, or Corporate Learning Trends and Innovation community on Ning. In April they organized a wonderful Learntrends activity that gave the floor to eLearning professionals all around the world for 24 hours. I could not attend at that time, but I am certainly looking forward to attend any future Learntrends event. The next event at CLTI is a showcase of eLearning in a broad sense. So anyone who whishes to propose, explain, unravel their eLearning case (mobile, social media, self-pased...) is invited to send their proposal. From the writings of Tony Karrer: "One of the hardest things to find are real-life examples of different kinds of eLearning solutions. On May 21, Learn Trends will be hosting a free online event where the people who have developed interesting eLearning solutions will demonstrate and briefly discuss what they've done. This is an online call for people who can "demonstrate" their system. Even if you can't participate - please help me get the word out on this. Because of my concerns about bandwidth - demonstrations will really be screen shot slides. Sorry. This makes it a bit harder to demonstrate 3D worlds, video based training, etc. But it can still be done - just screen shot it and plan to explain it. We especially would like participants who are developing solutions inside of organizations to participate. These are most often the hardest examples to see. To participate, you must be available May 21 (Thursday) from 9AM to Noon Pacific Time - PDT (for all you on Central European Summer Time: 6 PM - 9 PM (18.00 - 21.00) or for those in other parts of the world, look at the world clock converter). We expect to have more examples than we can show and discuss in the 3 hours, so we will likely only be able to choose some of what is sent in. We will try to choose a variety of different examples that represent effective patterns. We are also trying to come up with ways to effectively share examples that are not shown real-time during the session. 1. Please help me spread the word about this. 2. If you know of places that examples already are captured, please point me to those. Another aspect of this is beginning to capture examples that will be available online."